JW Anderson’s debut Spring Summer 2015 Mens Collection for Loewe has been highly anticipated by many in the fashion industry. Taking the Spanish luxury label to a refreshed and younger era, the collection is filled with many avant garde accessories that speaks volumes of Anderson’s highly original and androgynous style. One of the bags that came from this collection, the Puzzle Cross Body Sling Bag is the one that gets my attention. As the name suggests, the trapezoid-shaped bag is crafted from calfskin joined in geometric “puzzle pieces” and finished at side with a curving industrial zipper. The result is a unique silhouette that allows for innovative ways to carry. Attached the cross body leather sling to different D rings on the corners of the bag to reveal different facing and style... or if you are innovative, flatten the bag(Yes it collapses flat!) to use as simply as a clutch. The zipper position ensures you can open and retrieve your contents in any of these cofigurations... highly clever! Being featured on the lookbook, you can be sure this is one bag to watch out for. I have seen the bag in person and caress the fine leather, this is one bag to fall in love at first sight. Comes in gorgeous colours from black, red or tan brown (my favourite). Available now in Loewe store in Ngee Ann City... no waiting time till next SS2015 season. 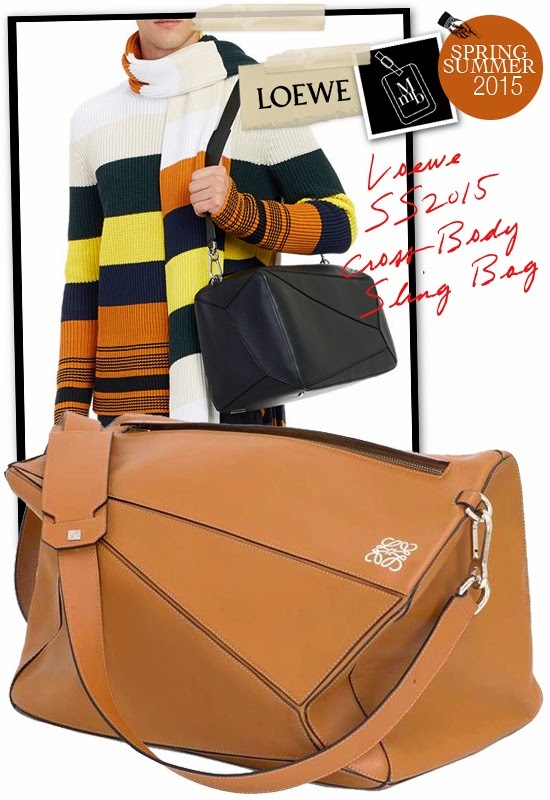 Barney’s is also allowing for pre-orders of the bag in black and tan brown (delivery in December) at USD2690. 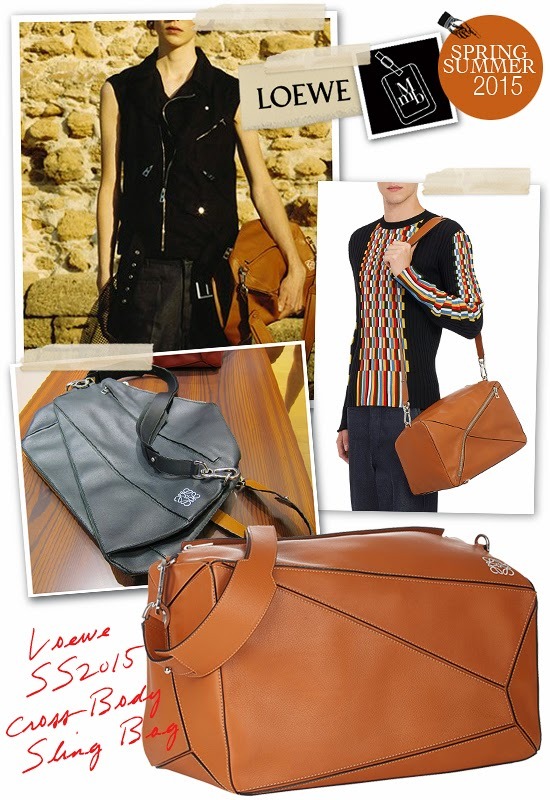 Click here for more pics of Loewe's SS2015 Puzzle Cross Body Sling Bag on my facebook fanpage. 'LIKE' my fanpage if you enjoy reading this post.